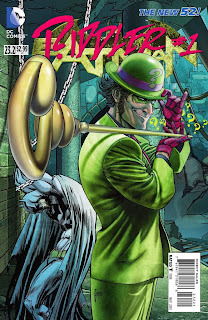 Riddle me this and riddle me that: what villains title should you check out at the drop of a question mark clad hat? DC's "Villain's Month" has been taking the world, and fans' residual income, by storm. With so many titles coming out so fast, it's easy to get lost in the madness. DC's marketing team may be the most fiendish villain of them all. In case you missed the opening events of Forever Evil, all you really have to know is that an evil version of The Justice League made it's way into the DC Universe and has beaten the good Justice League so badly that they are nowhere to be found. Each of the titles with a villain cover then tracks the exploits of DC's most notorious villains as they run rampant with no heroes around. 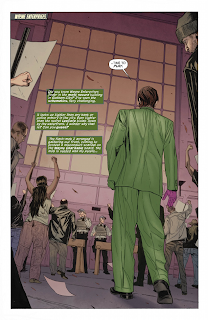 With so many colorful criminals on the stands it can be hard to make a choice, but I decided to start with my favorite green clad conniving always rhyming Batman villain, The Riddler. They say a hero is only as good as his villains and The Caped Crusader has some of the best villains in fiction. This had me going into The Riddler #1 with quite a bit of enthusiasm. Sadly, the story ended up being a short character vignette without any real consequence or revelation. I think the idea of getting to see villains finally play out their schemes uninterrupted could be really fun. However, as old British men everywhere say, the proof of the pudding is in the eating. The Riddler #1 opens with a flashback to a guard taking playing cards from The Riddler during one of his innumerable stays at Arkham Asylum. It then follows Edward Nigma as he does his best to foil the security measures at the Wayne Industries building. I think this is where it all goes awry. It might be cool to watch Shia LeBeouff try and beat day hire, blue collar, run of the mill security guards in the real world, but this is The Riddler. There's a reason he's a super villain. The issue is essentially just watching him flawlessly execute his plan. Admittedly, some tension finally comes when the head security guard is revealed to be the one who took his cards all those years ago. The Riddler's plan for vengeance against the poor sap is gloriously gruesome and a perfect showcase of The Riddler's brilliance and insanity. Ultimately, the book ends without any real cliffhanger, leaving promise at resolution in Batman #25 and you to decide if Eddie's high jinks truly merit $2.99. Did you get to see Edward's alARMing revenge? If so, sound off with your thoughts below.